Would you like to make a felt doll without seams? With a few simple tools and wool you can make a seamless doll. Some people have discovered a technique called needle felting to make a unique, seamless doll. Many are still not aware of this simple way to make dolls. Needle felting can be time consuming, but the results can be truly amazing and worth the effort. With just these items, you can make a fantastic doll. This technique can be mastered very quickly...even within a day. 1. Carded wool in several different colors. 2. Different shapes and gauges of felting needles. 4. Cloth covered floral wire or string. To begin needle felting the head of the doll, roll some of the wool into a small ball and jab deeply with your special barbed felting needle to get the inner fibers to felt and firm. Once the ball is firm but not hard, start adding different shapes to the felt doll head to create a nose, cheeks, etc. To create a body for your doll, twist two cloth covered wires into a stick man shape without a head. You don't have to use a cloth-covered wire, but it really helps to grab the wool and hold it in place. If you have plain wire, you can rough it up with pliers to get the wool to stay on the wire without spinning around and making wrapping difficult. Wrap your stick figure with wool around the arms, legs, and torso. Once the wire is wrapped, then you can add more wool to shape the felt doll body. Instead of using a wire frame, you can make a torso and limbs separately and attach them together. Take your limbs and string joint them to the body for a pose-able felt doll. Add the head to the body by stringing or by adding more wool and needle felting. Pose the felt doll as you like now or wait until it is completely finished. Next comes dressing your doll. You can use wool for this, too. Just shape the wool around the doll and needle for desired affect. Or, you can flat felt clothes and add them to your doll. Whenever I show my dolls, people are really in awe that there are no seams. Give needle felting a try and create your own seamless felt doll. 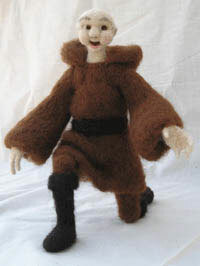 Read more about making a Felt Doll. Debby McCandless has raised alpacas for seven years and creates dolls and jewelry with the luxurious fiber they produce.